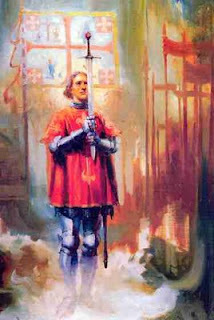 GRAND PRIORY OF GREAT BRITAIN: A national hero of Portugal will be canonized on April 26 in Rome by Pope Benedict XVI. 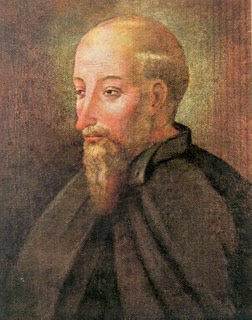 A national hero of Portugal will be canonized on April 26 in Rome by Pope Benedict XVI. In the April issue of Inside the Vatican, the Portuguese woman whose blind eye was healed after praying to Blessed Nuno, speaks for the first time on her tragic accident and the moment of her healing. Almost a century ago, Pope Benedict XV beatified Nuno (January 23, 1918), and proposed him as a model for the Catholic soldiers then engaged in combat during World War I. So one Pope Benedict, the 15th, beatified Nuno, and a second, Benedict XVI, will canonize him. Nuno is considered the founder of the Bragança Royal Family Dynasty of Portugal which ruled from 1640 until 1910. (Nuno’s daughter, Beatriz, married Alfonso, son of John I, whom he helped bring to power, starting the Aviz Dynasty.) The majority of Catholic royal families in Europe and Brazil claim lineage from him, including the recently beatified Charles of Austria, the last Hapsburg Emperor. Queen Isabella of Spain was one of Nuno’s granddaughters. Nuno even had descendants in the British royal family: Isabella’s daughter (his great-granddaughter) was Catherine of Aragon, the first wife of Henry VIII, and her daughter (his great-great-granddaughter) was Queen Mary Tudor ... Another descendant was Catherine of Bragança, wife of King Charles II (all his children were illegitimate to mistresses) who conversely became a Catholic on his deathbed in 1685. Blessed Nuno is most highly regarded in his country for masterminding the Battle of Aljubarrota in 1385. There, Portugal, in concert with England, stopped an invasion by Castile. Both allied nations were then in obedience to Pope Urban VI in Rome, whilst Castile and France followed the Antipope of Avignon, Clement VII (1378-1394). Nuno fought and won many other battles between 1383 and 1411, and, after peace was established with Castile, Nuno participated in the expedition in 1415 to Ceuta in North Africa, an action that was considered the first European missionary effort ... [M]onuments to him are scattered throughout Portugal and in many former Portuguese ... colonies. He was made the 3rd Count of Ourém in 1383, and his main feudal castle was in Ourém, the county where Fátima is located. He believed prayer, penance and commitment to the poor and needy, to be the true calling of nobility and, following the death of his wife, Nuno entered a Carmelite monastery he had established, taking the religious name Friar Nuno of Saint Mary. He was renowned for his devotion to the Blessed Virgin Mary and is considered the Founder of the Secular Order because the secular Confraternity of Our Lady of Mount Carmel, better known as the Confraternity of the Holy Constable, which he founded in Lisbon to support his work with the poor with contributions from its noble members, eventually evolved into the present Carmelite Third Order. This original Confraternity was re-established last year on November 6 (Nuno’s Feast Day) and hopes to be an active branch of the Secular Order providing funds for work with the poor and homeless of Lisbon in remembrance of Dom Nuno. When fighting the Castilians, he was renowned for his fairness to his enemies, and three times crossed the border to feed the peoples in the neighboring kingdom during famines, and to provide for the widows and orphans of the war. Pope Pius XII was on the verge of canonizing him by decree in 1940, but was dissuaded by Salazar (the leader of Portugal at the time). Blessed Nuno’s cause then remained at a stalemate. The rediscovery of his original grave site in 1996 in Lisbon by archaeologists proved that he had received a burial suitable for the last great knight of medieval Christendom. John Haffert, co-founder of the Blue Army of Our Lady of Fatima, regarded Nuno as the peacemaker who went to war and the precursor of Fátima, and promoted [sincere] devotion until his death in 2001. The Blessed Nuno Society (www.blessednuno.org) founded in Ourém Castle by Timothy Heinan and Blue Army Protector Bishop Constantino Luna, OFM, was later headquartered in the Diocese of Duluth, Minnesota (USA) as a Private Association of the Faithful, continuing to promote devotion to Nuno and, by engaging in works of charity on behalf of orphans and the homeless, being faithful to his example. The association administers orphanage projects in Portugal, Mexico and the Carib bean. The miracle of canonization took place in the Jubilee Year 2000, when a devotee of Blessed Nuno and volunteer at Ourém Castle, Guilhermina de Jesus, was blinded in her left eye as a result of boiling oil splashing on it, when she was frying some fish and chips. After all medical treatment proved unsuccessful, Guilhermina and her family prayed several novenas to Blessed Nuno, and her sight returned in that blinded eye inexplicably. On July 3, 2008, alongside a decree of heroic virtue, the Holy Father approved this healing as a miracle obtained through Blessed Nuno’s intercession. This will be the first canonization of a Portuguese saint since that of St John de Brito, SJ, Jesuit missionary and martyr, in 1947. As a member of the Carmelites of the Ancient Observance, it will be the first canonization in this branch of the family since that of St Mary Magdalen de’ Pazzi in 1669. The significance of two Popes named Benedict elevating Nuno to the last two stages of sainthood cannot be overstated. St Benedict of Nursia, the founder of Christian monasticism, from time immemorial has been considered the Father of Christian Europe, and so often Pope Benedict has lamented the continent departing from its Christian roots. The canonization of Nuno is a call to the whole of Europe to rediscover its soul, by imitating a man whose Catholic faith shone in both his public and private life. Nuno’s feast day is obligatory among Carmelites of the Ancient Observance on November 6 and optional among the Discalced Carmelites on April 1, who have also a Portuguese cause impending, that of Fatima seer, Sister Lucia dos Santos, whose family had a great devotion to the Condestável. Having been a Prior of the Hospitaller Order of Saint John (Order of Malta) and Commander of the Minor Religious Military Orders under the observance of the Cistercians of Alcobaça’s rule, such as Saint Benedict of Aviz and Saint Michael of the Wing, Dom Nuno will also be venerated as a Saint or Protector of these Orders. His official name will be Saint Friar Dom Nuno de Santa Maria Àlvares Pereira, O.Carm, but for the Portuguese he will always be fondly regarded as the Holy Constable or Beato Nuno.